Man, I love this series. I love these characters. I was afraid that it would be hard to get back into since its been so long since I read the last book, but nope. It just keeps getting better. It's smart, refreshing, thought provoking... Nothing I say will do this book justice. Love, love, love. it's no secret I'm a fan of Ms. Randall's work, but this book takes it to the next level for me. I laughed, I cried (yes, real tears), it left my heart racing, there were moments of "oh, no you di'nt! ", and there was heartbreak. all I want from any book I read is to FEEL something. this book made me feel ALL of those. if you're looking for a book that really makes you think and examine things, The Broken Ones is it. My poor Matty...and Silas...and Kennedy...and...and...and. just read this. The Broken Ones finds us in the aftermath of several events that happened over the course of the first semester of Kennedy's college life at CU. Her budding but still strained relationship with her dad Roland has come to light to the world. Her new friendships are put on the line when things go haywire. Relationships are tested. Faith is tested and again questioned. The Word is questioned. And all in the spotlight of a documentary now coming to campus. Can Kennedy and her friends find the peace they need to continue their journey with so many things against them? Can they find their way back to each for strength? So many things happen in this book that you wonder how one can fit them all in one book and still keep your attention. Andrea has done phenomenal in weaving the storylines together seamlessly so that you never feel like they are too much. They just feel like normal, everyday life. She has me hooked and I think anyone that gives this series a chance will find the same. Readers are always saying that there are books you like, books you love and then there are books that touch your soul. This series and especially this one has done just that. It has touched a part of my soul that has been dormant for a long time. Dormant because of questions and doubts that I felt alone in. Things I felt no one could help me with but Andrea has weaved a story of exactly what has been plaguing my faith. Questions and doubts. It's like she has taken a part of me and put in on paper. K Sawyer has brought all my questions and doubts back to the surface but instead of pushing them back down and ignoring them I have made the decision to explore these and bring something back into my life I finally have realized I am missing. So much more than expected!Jesus Freaks 1, was a leap of faith for me in Andrea Randall. Jesus Freaks 2 had me solidly rooting for her to take this story in a direction that touched and moved me. But Jesus Freaks 3, was everything I could've hoped for and so much more. The second half of the book was incredible, funny and touching and far more thought provoking than your average book. I am SO glad Randall took the time to bring us this story regardless of how difficult. I was initially irritated to hear there was a cliffhanger and another book, but having g read the last paragraph, I am at peace with that decision. It will be hard, but Randall will make it worth the wait! I loved this book. I love the entire series! Ugh now we wait for book 4. I feel like praying for not a long wait, lol. OK so still love Kennedy, Roland, Matt, Jonah, Eden, and all the gang. I love seeing Matt getting stronger, physically, emotionally and spiritually. I still think they belong together though, not gonna lie I am hoping he comes out of this ordeal stronger and fights for everything and everyone he wants, not going into detail so not to write spoilers. Silas, I did a total change of heart with him, I hope he can accept his true self. Ah, Loved.It. 5 stars from me. Loved this book. ANother great read by Andrea Randall. This book inspires me to check out more parts of the bible. I really like how she creates these friendships & bonds with the characters in the books considering they came from such different upbringings and I love Kennedys passion. I am so torn between Jonah & Matt. So Torn. Need next book NOW. I have loved all of Andrea Randall's works and this one was no different! I love books that make me think and possibly question things I believe. This series has done that! Kennedy is such a dynamic character and I love the life lessons she is having to go through and figure out. I look forward to seeing where she leads next. My goodness!!!!! This series just keeps getting better and better. I can't wait for you all to read this one. Aaaaand I can't wait for the next book! Wait! What? You mean I have to wait for her to write the next one??? That was a terrible cliffhanger to leave me with. Didn't know when this one had come out, so happy surprise for me! Andrea continues to get better and better with this series. There is just so much to enjoy and to think about. 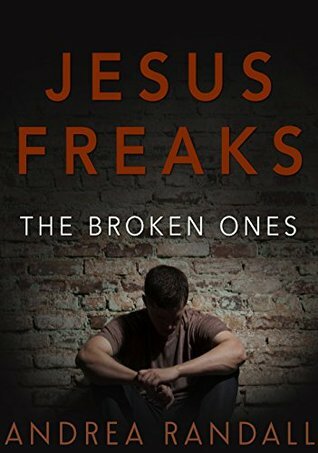 More greatness from the Jesus Freaks!4 1/2 stars for this one, looking for a little more and wasn't expecting such a big cliff at the end, hoping the next book is out SOON! This series is SO good! But I need the fourth book NOW!!!! Andrea Randall - Currently working on a new New Adult series,titled, "Jesus Freaks".Titles Now Available:In the StillnessNocturneThe November Blue Series:1. Ten Days of Perfect2. Reckless Abandon3. Sweet Forty-Two4. Marrying Ember5. Bo & EmberNovellas (stand-alones):1. Something's Come Up2. Bar CrawlI started writing poetry long before writing fiction. I firmly believe Poetry is a solid foundation for all other forms of writing. It taught me that a single word can make or break the world. I write fiction because my characters have a story and they want me to tell it. I hope you enjoy the pieces of my soul that I share with you.